Here’s another sweet salad that seems more like a dessert to me. 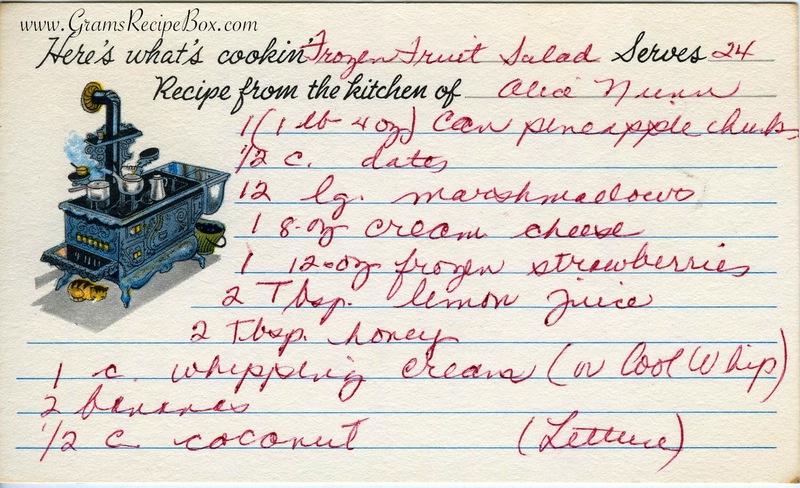 My mother wrote out this recipe, and I think I can remember eating it as a kid. I believe she would freeze the smaller containers and bring them out for various occasions. While I don’t have any distinct memories of liking or disliking it, I do recall that if it wasn’t thawed fully, it was impossible to eat. I assume the salad would be served on a lettuce leaf. Also note that the directions indicate to stir in mayonnaise, but the ingredients do not list it. Is it possible that Mom meant the marshmallows should be stirred in? Drain pineapple. Cut dates small, marshmallows 1/8ths. Cream cheese at room temp. Thaw strawberries til syrup is thawed. 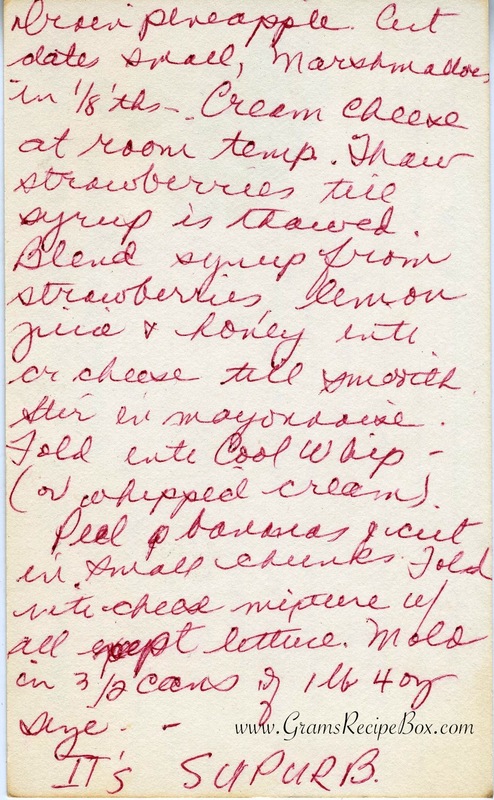 Blend syrup from strawberries, lemon juice & honey into cream cheese til smooth. Stir in mayonnaise. Fold into Cool Whip (or whipped cream). Peel bananas and cut in small chunks. Fold into cheese mixture w/ all except lettuce. Mold into 3 1/3 cans of 1 lb 4 oz size. IT’S SUPERB!